Kids Martial Arts Classes Gerald, MO. Gracie Barra’s new Jiu Jitsu school in Washington MO, is proud to offer it’s incredible martial arts classes to Gerald residents who are looking for a kid’s martial arts program for their child. Our Kids Jiu Jistu courses are an excellent introduction into the Brazilian jiu jitsu martial arts, and can help your child grow into a more well rounded and driven individual. Led through every class by our Jiu Jitsu Instructors, your child will have greater confidence, athleticism, and a sense of self and purpose that they won’t be able to receive anywhere else. 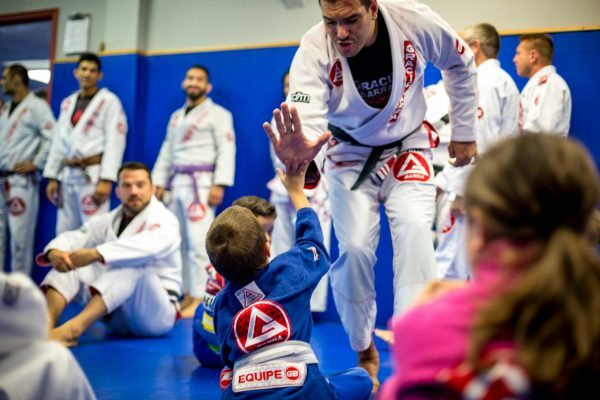 With Gracie Barra Jiu Jitsu, your child will learn more than just martial arts holds, they will learn how to be a more responsible individual who can contribute to their family, friends, and community in a positive way. If your child is excited to learn the most advanced martial arts available in Gerald, contact our team today to start your first class! With Gracie Barra Jiu Jitsu, your child will never learn katas and holds that aren’t effective in real-life self-defense . We also aren’t a belt factory, and that means when your child comes to our school they won’t be provided with a meaningless belt because they broke a board or performed a high kick. We want your child to have actual self-defense skills that they can use to protect themselves and others, while also being mature and confident individuals. Here are many of the other benefits your child can enjoy while they train at our jiu jitsu school near Gerald. Are you ready for your child to be part of an exciting and incredible martial arts program? Are you prepared for your child to be more confident, coordinated, and athletic than you may even be? Our Kids Jiu Jitsu Classes near Gerald will do just that. WEvery martial arts class should be an exciting and positive experience for your child, and with our team it will be. When you’re ready for you child to join an amazing jiu jitsu martial arts team, contact Gracie Barra today!